This Crow’s remount of the 2017 Shaw production of Will Eno’s Middletown, is the story of a generic town, equidistant from its neighbouring towns, with a stable population, elevation, not too big, not too small. 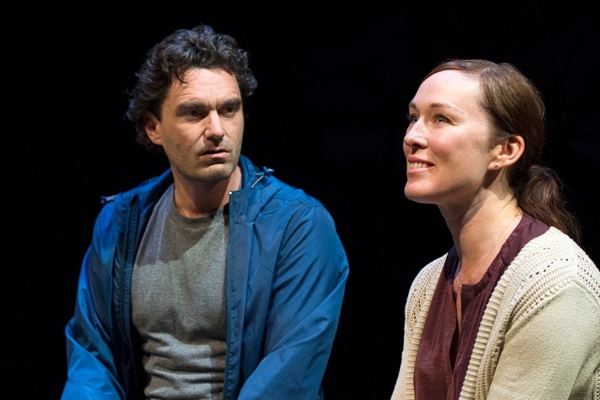 This is, not surprisingly, a kind of metaphor, and the play is less about a grand narrative than it is an existential meditation on the quotidian details of life itself. The title is a direct allusion to Thomas Wilder’s Our Town, an early 20th century play commenting on how people’s fear prevents them from being present in their own lives. Eno’s play, by contrast, is less moralizing and more existential, a key shift that would help it resonate with a 21st century audience. Meg Roe’s direction presents the audience with a blurred line between artifice and life before the show even begins – as the house opens the actors mingle and speak to the audience members as we file in. The stage forms the centre of the space, with the audience on all four sides. The early interactions offer an easy transition to the show, which begins with one of the actors listing off welcomes to us as audience but also inviting us in as part of the community of the production. If the philosophical aspect of the play doesn’t come across in the first half, a cute vignette right before intermission helps to reinforce the play’s metatheatricality by having several characters comment on various plotlines. Just like the town, the characters are archetypes: the cop, the librarian, the town drunk, the jack of all trades, etc. It is a difficult task for the actors to imbue these kinds of characters with a compelling specificity, and the results in this production are uneven: the librarian (Corrine Koslo) is immediately a substantial character, greeting different members of the town with matronly affection, and Mary (Moya O’Connell) is instantly endearing in her nervous anticipation and social awkwardness. Other characters feel less grounded, like the police officer whose aggressive violence feels oddly passionless, and the town drunk, whose addiction doesn’t have a credible emotional core. I was also bewildered by Mary’s affection for John, a hapless jack of all trades, whose greatest virtue seems to be the fact that he is around more than her husband. Perhaps I’m just weary of too many stories of women falling for men simply because they are there, but their connection feels unmotivated. Finally, the script is dominated by pessimism, evident in the much-discussed nostalgia for their youth, when things were better, before people grow up, become untethered, and lose themselves. Of course, the play also shows us glimmers of how people reconnect, some more successfully than others. A late scene with Mary and her newborn reminds us of this possibility, but my favourite scene consists of an astronaut (Karl Ang) floating around in space, commenting on the vastness of the universe. The staging is clever, achieved by Ang sitting on a rolling chair being pushed around the stage by fellow actors while the main stage lights are blacked out, revealing Kevin Lamotte’s spectacular lighting design of hundreds of twinkle lights hanging from the ceiling. Here we get a sense of a man floating free, amidst the possibility and beauty of the stars, the distance and isolation creating a sublime experience that cannot but force him to feel the full poignancy of his humanity. How these different variables add up will have vastly different effects on the audience: this play might be exactly your thing or it could disappoint. But as existentialism reminds us, we get to choose if it’s worth the risk.